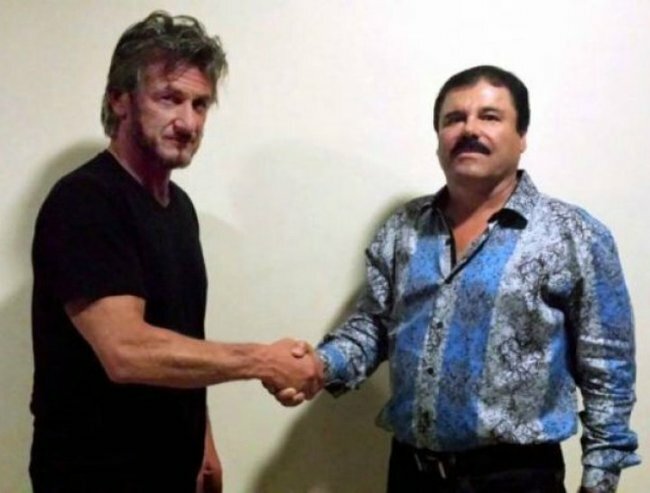 Sean Penn interviews El Chapo Guzman in Mexican jungle. Sean Penn, Oscar-winning actor, interviewed drug baron at Mexican jungle hideout. Oscar-winning actor Sean Penn conducted an extensive sit-down interview with Joaquin “El Chapo” Guzman at his Mexican hideout, a meeting that played a role in the drug kingpin’s arrest, authorities say. Guzman, the leader of the Sinaloa drug cartel, wasrecaptured in northwest Mexico on Friday and sent back to the jail he escaped from in July last year through a tunnel that led straight into his cell, embarrassing authorities. The interview, published by Rolling Stone magazine a day after the rearrest, was brokered by Mexican actress Kate Del Castillo, who herself played a Mexican drug queen in a well-known soap opera. Penn met Guzman in a jungle in October to conduct the “seven-hour sit-down” with the capo, whom he later followed up with, sending him questions to which Guzman responded with videotaped answers. The actor said Guzman had sent engineers to Germany for three months of training in tunnelling prior to his escape. Authorities said the meeting between Penn and Guzman was part of the investigation that helped rearrest the drug baron. “Mexican authorities had knowledge of this meeting,” a federal official said on condition of anonymity after Rolling Stone published the story. On Friday, Mexico’s Attorney General Arely Gomez said they were able to locate Guzman after he met with actors and producers in the hope of making a biopic about himself. Guzman was involved in trading drugs from the age of 15, and said it was the only way to survive. “The only way to have money to buy food, to survive, is to grow poppy, marijuana,” he said, speaking in Spanish. The Mexican government is considering whether to extradite Guzman to the United States, where he faces multiple drug-trafficking charges. Guzman escaped maximum security prison through a tunnel which led from his cell to a building 1.5 kilometres away, sparking a huge operation to recapture him. The chase ended in the north-western coastal city of Los Mochis, in his Sinaloa home state, where marines clashed with gang suspects before capturing Guzman. The Mexican government received a formal extradition request from the United States in June, two weeks after Guzman’s escape from prison. President Enrique Pena Nieto’s government had balked at extraditing Guzman prior to his prison break in July, but the federal official said the administration is now considering the possibility. “The federal government will study all the options within the legal framework and naturally these options include the extradition requests and the proceedings that he must also face in Mexico,” the official said on condition of anonymity. Mr Nieto and other officials have yet to take a public stance on the potential extradition. Following Guzman’s escape in July, the Mexican attorney general’s office received an arrest warrant for his extradition. His lawyers filed for an injunction to block the warrant but it was eventually rejected. One of Guzman’s attorneys, Juan Pablo Badillo, promised a legal battle that could reach the Supreme Court. “He shouldn’t be extradited because Mexico has a fair constitution,” he said. US politicians called for Guzman’s extradition following his arrest over concerns that the wealthy drug lord could pay his way out of prison again.